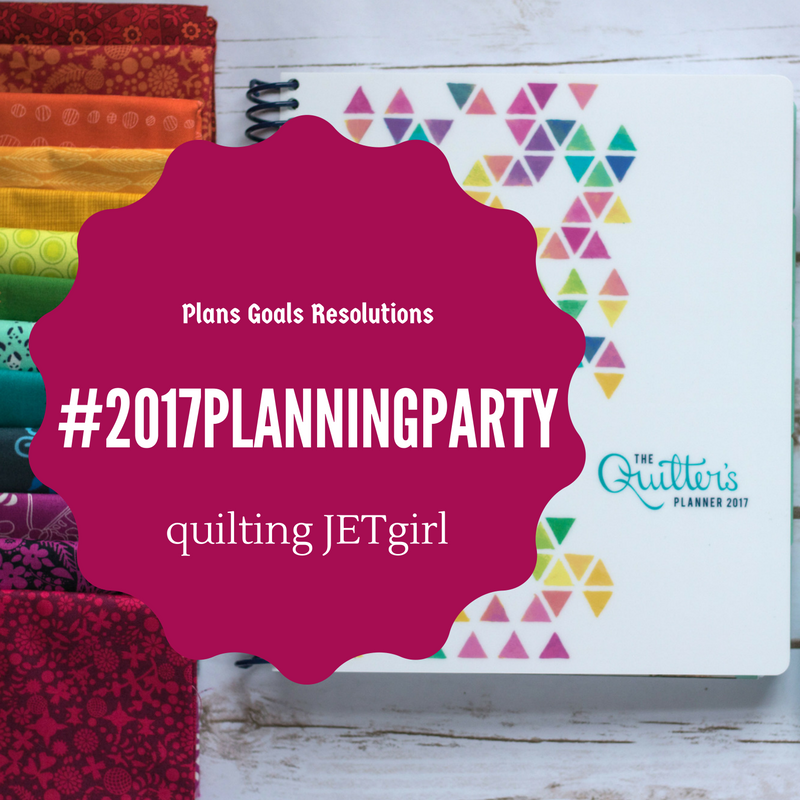 Before I could decide on what my quilting goals would be for 2017, I needed to look back and see how I did his past year. Not much changed since my mid-year review in July. In fact, the only thing that changed was some more home decor sewing. It's only taken me 3 years now to realize that I've been I've been approaching my sewing and quilting goals all wrong. I am a detail-oriented person. When a director said "I want Peter Pan to fly across the stage..." it was my job as a stage manager to make sure all of the specific details happened (platforms in place backstage, regulation tested rigging, union stagehands trained specifically in actor flight, costume harnesses, etc.) and not just leave it as a vague idea. In wanting to give myself creative flexibility I essentially left my goals too vague for me to take action on in a meaningful way. BB-8 quilt - I really wanted this for Christmas for my son, but since he didn't know about it in the first place, I'm okay that I didn't finish it. The new deadline for this is for his birthday in March. Stash Bee 2017 quilt - technically it's not a WIP yet - I have 1 block made but it won't be revealed until January 1st on the Stash Bee blog. The blocks I get from this bee are going to be made into a lap quilt for my cousin who is getting married in March. Aspen Frost Jubilee Quilt - this was an orphan block project that I adopted a few months ago from Libby at Life on the Hill. Between finishing up all the Pulse quilts I got the sashing started but still need to get those blocks put together. This project has been an orphan long enough. Pinwheel Wedding Quilt - add outer border and quilt by the end of the year (actual wedding is still TBD so there is no rush on this finish). Possibly quilt this on my DSM, although it's a bit big. Could be good practice with ruler work. Midnight Mystery Quilt - needs to be quilted on a long arm. This one is going to take more than 1 day since it's a large queen size so I need to find a friend that can allow me that much rental time. Plaid Picnic Scrap Quilt - while this is not a hard deadline quilt, I want to make this project my "in-between project" - the one that I'm pinning or sewing between the other priority projects, sort of like a leader-ender project. These are projects that I really want to do for myself. I'd like to make at least 1 block a month from the pattern Bubbles. Leanne from the Devoted Quilter posted this tutorial to make these adorable free motion quilted ornaments. I admit, I'm a bit intimidated to try flow quilting like this but I think it will be a good exercise for me. I'd like to try and make one or 2 a month. I'd like to make a quilt using my own block pattern Dutch Windmill - I'd like to make 1 block a month using all solids from my stash. Yes, we all seem to say this at some point, and I'm no different. I seem to have plenty of fabric and I don't really go on large fabric buying binges. I'm really good about only buying something that I need but I did have a problem with buying precuts a few years back and a goal that was on my list last year was to use more of my precuts. Again, that was too vague so here is a more specific goal, and these are if I feel the need to start a new project! Layer Cake Quilt - using existing layer cakes of solid navy and Bonnie & Camille with the pattern/layout that I planned earlier this year. This is going to be a gift for my brother and his wife for next Christmas. Somerset Jelly Roll & White Jelly Roll -- I think I'd like to use Chelsea's Picnic Pinwheels pattern from Patch the Giraffe. Make at least 1 quilt to donate to charity. After last year's huge Pulse initiative, it seems a bit ridiculous to only strive for 1 quilt but I'm being realistic. The goal, though, is to still use what is in my stash. There are still so many projects that I want to tackle but I have to be realistic and remind myself that it's okay to say no, and just soak up all the creative energy from my cozy chair in the corner. Having taken over Stash Bee this year, I think it's important to not over-commit myself this year. I also know that I'm going to be a bit more involved in my local guild and will be coordinating some long distance swaps in 2017. Last but not least, I think I'd like to try a mini swap of some sort through Instagram. Setting goals each month really helped to keep me accountable so this is something that I need to continue doing. It appeals to my organizational nature of getting to check something off of my to-do list each month. So there it is, all laid out for 2017. More specific than in previous years which will hopefully lead to more success. Yes, specificity helps. I have the same problem. Will look forward too seeing a completed Jubilee! Wow that is an awesome list, I can't wait to see everything unfold. I have noticed that specific goal setting (through the monthly goals) works really well for you, so I like the way you made your yearly goals more specific, too. I hope you have a wonderful 2017 and I look forward to seeing what you create! Diana, I LOVE your "it's okay to watch from the sidelines and still be inspired"! It puts into words exactly what I have been thinking about for the past few weeks as I think about what I want for 2017. I quoted you in my own 2017 goals (with credit and link) and I hope you don't mind. Good luck with all that you want to accomplish in 2017! Happy New Year! Your goals for 2017 are well thought out and your plan is specific. I hope this helps you stay on track with the projects you want to make. The list seems long- lots of projects to work on along with working and being mom to a kiddo. Go for it and if it becomes overwhelming, step back, re-evaluate and trim the list. Thanks for taking the time to comment! I love hearing from my readers. I typically respond directly to your email unless it's an answer that I think everyone would be interested in hearing. If you are a no-reply blogger (and I know that blogger doesn't play nice with other blogging platforms! ), I will reply directly on my website. Thanks for stopping by! I'm the crafty redhead behind this blog. Join me in my little corner of the internet while I share my love of quilting. © Diana Mattoni/Red Delicious Life, 2013-2019. Unauthorized use and/or duplication of any material on this blog without permission is prohibited. You may link to or pin my content, but please cite my original post. Thank you.